News 1 reported on March 17 that a 31-year-old Korean American English instructor had been booked without detention in Seoul for using bitcoin on January 6 to pay $480 for 126 ecstacy pills from an overseas drug selling site with plans to sell them. Prosecutors also found that he'd taken a pill at a concert at Jamsil Stadium last June with a Mr. Park, as well as one at a water park in Yongin in October. Speaking of drug arrests, in the past I've posted about Supreme Prosecutor's Office reports on annual drug arrests, such as in 2011 and 2012. The Office publishes statistics monthly here; the year end report for 2013 is here. The total number of arrests for 2013 was 9,764, up 5.5% from 9,255 in 2012. Worth noting is that the number of those booked with detention (ie held in prison until trial) was 2,040 in 2012 and 2,062 in 2013. 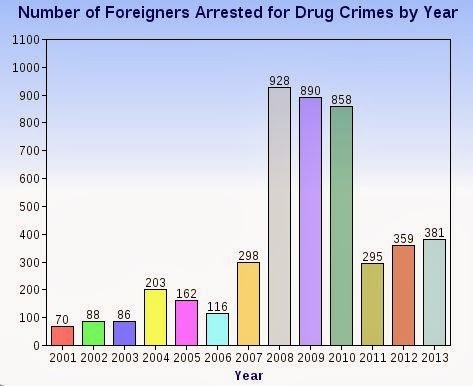 2011: Korean nationals, 18.5 arrests per 100,000, foreigners, 21.1 arrests per 100,000. 2012: Korean nationals, 18.5 arrests per 100,000, foreigners, 24.8 arrests per 100,000. 2013: Korean nationals, 20.1 arrests per 100,000, foreigners, 24.1 arrests per 100,000. There really aren't large discrepancies when you make these comparisons, but that didn't stop the Ministry of Justice in 2011 2012 from expanding the drug tests for E-2 visas to non-professional Employment (E-9), ship crew employment (E-10), or Working Visit (H-2) visas - about half a million people. And speaking of immigration statistics, the number of people on E-2 visas continues to drop, from 22,541 in 2011 to 21,603 in 2012 to 20,030 at the end of last year. How many of these "foreigners" were 재미교포, 재일교포, 조선족 and 고려사람 – in other words, members of the 민족? When are the authorities going to get this epidemic of foreign crime under control – especially all those terrible native English teachers? So they increased the tests in 2011..right after the numbers were 2-3x higher than they are right now. In 2010 arrests were nearly 3 times higher, and one can be sure the amount of foreigners was slightly lower. If you want to talk about a change made 3 years ago, why don't you compare the rates 4 and 5 years ago. It's going to be somewhere around 60-65 per 100,000 and that's a pretty huge swing. My mistake - the expanded tests were introduced in 2012, not 2011. So they had access to statistics showing a drop for foreigners to arrest rates similar to Korean arrest rates. The thing is, though, that I doubt they bothered to look at the statistics showing the drop, especially since they were not mentioned in the media. Every year it increased or was high, the media happily reported the increased or high number of arrests, but the year it dropped, nothing. Silence. Dropping drug crime stats among foreigners is not a story the media, or the Supreme Prosecutor's Office, which releases the statistics, is much interested in telling.